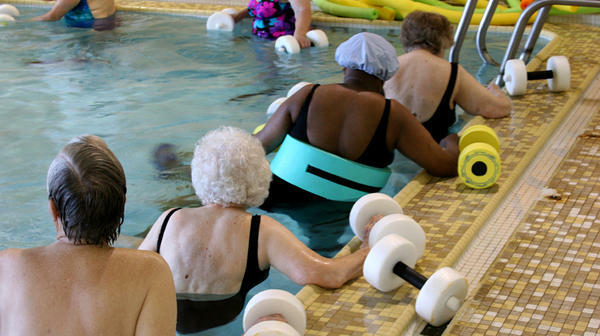 Swimming is one form of exercise that can help prevent arthritis from getting worse, doctors say. Her knees hurt, too. But that doesn't stopped Zaden from going to the gym and getting on a treadmill for 15 to 30 minutes. Her doctor, UCLA Medical Center rheumatologist Roy Altman, says more people with arthritis should follow her lead. "The one thing that people don't understand is that you have to do something," Altman says. "When you don't do anything with osteoarthritis of the knee, arthritis actually gets worse." Three years ago, federal health officials recommended that people with arthritis exercise moderately every day for about 20 minutes. But that's not what's happening. A recent study at Northwestern University looked at activity among 1,000 adults, between 49 and 84 years old, who had osteoarthritis of the knee. Ninety percent of the people were not exercising, according to lead scientist Dorothy Dunlop. "That means they did not participate in any moderate activity lasting at least 10 minutes at any point over the course of a week," she says. Even more alarming, 40 percent of men and nearly 60 percent of women were total couch potatoes, Dunlop says. "Two-thirds of their day was being sedentary," she says. "It was sitting — might have been sitting at the office, might have been sitting in front of television. We don't know details of exactly what they were doing, but it was very clear that a large portion of that day was spent very close to zero" exercise. Arthritis slowly breaks down the body's natural shock absorbers, the cartilage, that jelly-like substance between our bones and in our joints. When that happens, blood doesn't circulate as freely and doesn't deliver adequate nutrition to the cartilage. All the cartilage nutrition, says Altman, comes through the joint. Massaging the joint through exercise helps get the blood supply going which, in turn, helps cartilage take in nutrition. Another big plus for exercising through arthritis pain: Muscles surround the joint, and when muscles are bigger and stronger, the joint is more protected. By exercising, "you actually reduce the stressors on the joint itself," Altman says. "The muscles take up the weight and take up the pressures, instead of the joint taking up the weight and the pressures." Exercise doesn't reverse damage that's already done. But it helps prevent arthritis from getting worse, and it has the added benefit of keeping excess pounds off. That can make a huge difference on the joints that support most of the body's weight: the hips and knees. "Six times your body weight goes through the inside of the knee," Altman says. "If your muscles are weak, that adds direct pressure that's not very good for the knee. If the muscles are stronger, you reduce that pressure that goes through the knee and improve the function." The heavier you are, the greater the pressures on both your knees and hips. Altman says if you have arthritis and don't exercise, it's time to start. But begin slowly. You need exercises like walking to build endurance, and Pilates or yoga to build strength. On a Monday after the holiday weekend, it's MORNING EDITION from NPR News. I'm Steve Inskeep. In "Your Health" today, we'll hear about helping teenagers lose weight. That's in a few minutes. First, to a health issue for older people. Those who suffer the pain and stiffness of arthritis are not likely to be enthusiastic about working out. But arthritis specialists say that's exactly what they need to do. Here's NPR's Patti Neighmond. PATTI NEIGHMOND, BYLINE: Sibyl Zaden is 65 years old. In the '70s, she ran marathons. In the '80s, she did the Ironman triathlon in Hawaii. Today, she has osteoarthritis in her shoulders and her knees. SIBYL ZADEN: My problem is lifting my arm. It's very painful. You know, I can go up to there, and then I can lift it halfway - and that's it. NEIGHMOND: Her knees hurt, too. But that hasn't stopped Zaden from going to the gym and getting on a treadmill. ZADEN: I go anywhere from 15 to 30 minutes. DR. ROY ALTMAN: At what speed? ALTMAN: That's pretty good. That's pretty fast. NEIGHMOND: Today, Zaden's at UCLA Medical Center for a routine visit with her doctor, rheumatologist Roy Altman. ALTMAN: Sibyl is a person who has decided that she's not going to let the arthritis beat her. So she continues to be physically active. And she knows that if she slows down and doesn't do these exercises, she's not going to be as active as she is. NEIGHMOND: Altman says Zaden's doing exactly what everyone who has arthritis should be doing. ALTMAN: The one thing that people don't understand is that you have to do something; that when you don't do anything with osteoarthritis of the knee, arthritis actually gets worse. NEIGHMOND: Three years ago, federal health officials recommended that people with arthritis exercise moderately every day, for about 20 minutes. But that's not what's happening. A recent study at Northwestern University looked at activity among 1,000 adults between the ages of 48 and 84, who had osteoarthritis of the knee. Scientist Dorothy Dunlop headed the study. She says 90 percent were not exercising. DOROTHY DUNLOP: That means they did not participate in any moderate activity lasting at least 10 minutes, at any point over the course of a week. NEIGHMOND: Even more alarming, Dunlop says, 40 percent of men and nearly 60 percent of women were total couch potatoes. DUNLOP: Two-thirds of their day was being sedentary. It was sitting. It might have been sitting at the office; it might have been sitting in front of a television. We don't know details of exactly what they were doing, but it was very clear that a large portion of that day was spent very close to zero. NEIGHMOND: Here's why moving, and exercise, is important. Arthritis slowly breaks down the body's natural shock absorbers, cartilage - that jelly-like substance between bones and in our joints. When that happens, the blood doesn't circulate as freely, and doesn't deliver adequate nutrition to the cartilage. ALTMAN: All the cartilage nutrition comes through the joint. And the massage of the cartilage by exercise takes the nutrition in, and the byproducts out. NEIGHMOND: Massaging, or moving the joints during exercise, stimulates nutrition and blood production. And here's another reason exercise helps joints: Muscles surround the joint, and when muscles get bigger and stronger, the joint is more protected. ALTMAN: You actually reduce the stresses on the joint itself. The muscles take up the weight and take up the pressures, instead of the joint taking up the weight and the pressures. NEIGHMOND: This doesn't reverse damage that's already done. But it helps prevent arthritis from getting worse, and exercise has the added benefit of keeping excess pounds off. That can make a huge difference on the joints that support most of the body's weight: the hips and knees. ALTMAN: In the knee, six times your body weight goes through the inside of the knee. If your muscles are weak, that adds direct pressure that's not very good for the knee. If the muscles are stronger, you reduce that pressure that goes through the knee and improve the function. NEIGHMOND: Dr. Altman says if you have arthritis and don't exercise, it's time to start. But start slowly. You need exercises like walking to build endurance, and Pilates or yoga to build strength.